Two weeks ago I gave a keynote address at the Conney Conference on Jewish Art at the University of Wisconsin – Madison. Douglas Rosenberg, chair of the Art department, organizes a dynamic and diverse conference every two years. This year attendees included art historians, artists, metalsmiths, dancers, choreographers and others. This year’s theme celebrated and challenged Harold Rosenberg’s essay, “Is there a Jewish art?” The conference asked, “Is there a Jewish Art, yet?” Here I’d like to share just a few of the highlights. Ben Schachter’s keynote address. Photo by Jonatas Chimen. Larry Silver, the Farquhar Professor of Art History at the University of Pennsylvania, related Harold Rosenberg’s essay to linguistic theory of Roman Jakobson. Jakobson claimed that minority groups, including Jews, can be “marked.” In otherwords, once an outsider, always an outsider. Silver notes that Rosenberg placed himself between groups. As an unaffiliated Jew (someone who had not clearly chosen a religious community or a political banner), Rosenberg strove for a kind of assimilation shared by other Jewish intellectuals. Jonatas Chimen Dias DaSilva-Benayon discussed his family lineage as a crypto-Jew; his family was forced to deny their Jewish heritage and only in recent generations has Judaism played a significant role. While discussing other artists with similar backgrounds, DaSilva-Benayon work, performance videos, played behind him. Also that day, Jim Cohen discussed Jewish metalsmithing. He provided historical examples of Judaica but also showed how the field has expanded to include found objects, humor, and playfulness. Two examples really stood out. One was a pair candlesticks made from a mother of pearl inlayed opera glasses. The other, his own design, was a Kiddush cup made from metal and Legos. I hope he attends again and shows more work from his studio. Later that day we heard from Tony Michels, the George L. Mosse Professor of American Jewish History. Michels placed Harold Rosenberg in the intellectual milieu of his time and place. Karen Goodman and Richard Hecht presented their observations on Jewish art and dance. Then Goodman screened her new film, Dybbuk Remix: Dancing Between Worlds. This film overlaid Goodman’s dancing with the historical film Dybbuk. Hecht recorded Goodman dancing in the same synagogue in which the dance of death from the original movie was filmed. Later that afternoon Ella Levitt, critic, curator and previously art writer for the Jerusalem Post, presented her observations of Contemporary Israeli artists Sigilit Landau and Sharon Glazberg. These artists explore the use of landscape and the land as defined by politics all the while building on international artistic practice. She asks, “Is art produced by Israeli artists more authentic than Diaspora art through its grounding in the Land?” Historical writers say yes, but for Levitt the current position of artists is not as clear. Much of the next day was dedicated to dance. The mix of visual art and dance make the Conney a truly interdisciplinary conference. In fact, throughout the conference the Jewish Choreographer’s Workshop developed a performance shared with the conference attendees at the end of the day. Before then, Hannah Kosstrin presented her work on the Inbal Dance Theater arguing that the ethnic elements of the troupes performance, instead of being integrated into modernism were marginalized, separating traditional forms – Jewish dance – from the dominant stream. Henia Rottenberg suggests an alternative view. As choreaographers attempted to create a Zionist dance, she notes distinctive Jewish elements that remain. After Steve Reich’s “Music for 18 Instruments”. Photo by Douglas Rosenberg. 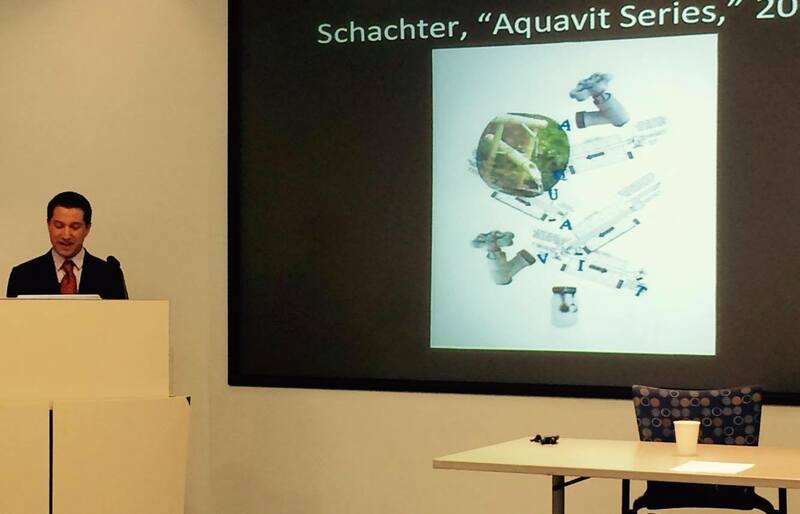 Most notably, Judith Brin Ingber delivered the second keynote address. Her topic critiqued Rosenberg asking, if the critic’s gaze is “myopic or blind” as he insists that art is of a certain kind, the kind that belongs in museums, to an extreme ignorance of dance and performance. I am particularly provoked by this idea because just as I naturally see Rosenberg’s blindness with respect to visual Jewish art, Ingber points out that dance has the same questions. The Jewish Art Salon was well represented by the roster of speakers and also by Richard McBee, who participated in a round table including Ruth Weisberg of the Jewish Artists’ Initiative and David Harris of RIMON, the Minnesota Jewish Arts Council. The three discussed their observations and optimism for Jewish art as well as their organization’s activities. During the following conversation, we were all encouraged by mention of many other Jewish arts organizations including: LABA, the American Guild of Judaic Art, the Alliance for Jewish Theater, Jewish Arts Collaboration in Boston, Art Kibbutz, the Midwest Artist Lab, and a few others. If you know of more, please let me know! Ruth Weisberg (seated on the right) attending a dance performance. Photo by Douglas Rosenberg. Ben Schachter presenting. Photo by Jonatas Chimen. Ben Schachter is professor of Fine Arts at Saint Vincent College. He received both MFA and MS degrees from Pratt Institute. He is an ELITalks speaker, and has addressed artist groups and attended conferences in the United States and Israel. Thanks for the review of another stimulating Conney Conference, Ben. And for your keynote. 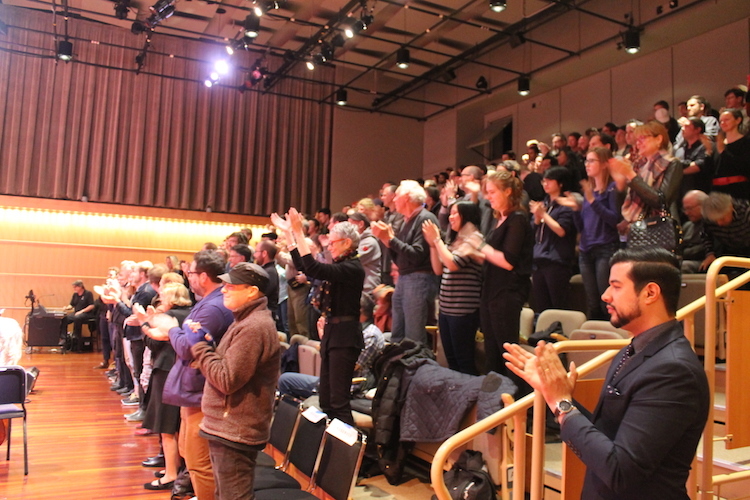 I just want to add that the above photo of the standing ovation was for the rousing live performance of Steve Reich’s “Music for 18 Instruments.” While listening to it, I was very much thinking about your use of the words Process and Product. Thank you Karen. I amended the photo’s caption to incorporate your info.